In light of the planned test launch of the Minuteman III Intercontinental Ballistic Missile, the Nuclear Age Peace Foundation held a press conference Friday, Feb. 24 to discuss the urgency of nuclear issues in the United States. The speakers participating in the conference shared their concerns about the testing and usage of these nuclear weapons. The nuclear-capable missile was launched from the Vandenberg Air Force Base in Lompoc, Calif. bound for Kwajalein Atoll of the Marshall Islands, over 4,000 away. Although technically unarmed, the missile contained depleted uranium that can still have detrimental affects on the island’s inhabitants. During the conference, President of the Nuclear Age Peace Foundation David Krieger said the safety of the United States is threatened by our handling of ICBMs because the consequences of launching the nuclear missiles have the potential to be unimaginably devastating. Although the goal of the NAPF is to eliminate all nuclear weapons, he touched on the problem of the lack of environmental and human impact statements projecting what would occur if these weapons were to be used. “This is absolutely essential information for every citizen of the United States and the citizens of every country in the world,” Krieger said. Educating the public and raising awareness seems to be one of the key points of those involved with the NAPF. Daniel Ellsberg, the former U.S. military analyst known for exposing the Pentagon Papers in 1971, emphasized the atrocity of governments having such an incredible amount of destructive power. He explained that the smoke from the explosion of one of these missiles would cloud the Earth’s atmosphere enough to prevent the growth of all plant life for 10 years. 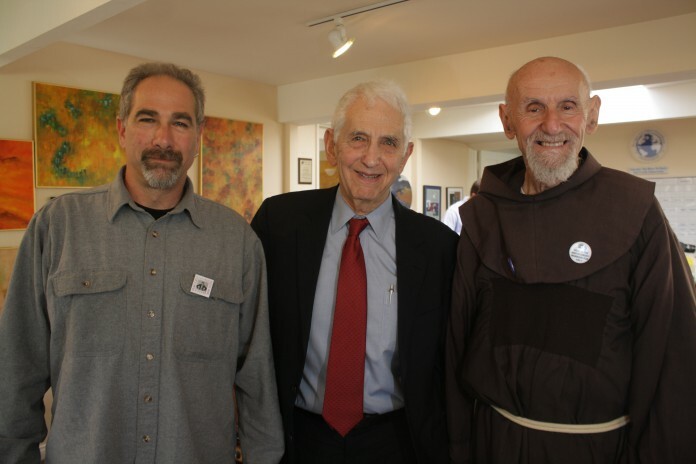 “It is inexcusable, outrageous, to possess the ability to end all life on earth,” said Ellsberg. Solely testing these high-powered nuclear missiles poses the risk of accidental misfirings or explosions. During his service for the Reserve Officer Training Corps Air Force, long time peace activist Father Louis Vitale learned how easily civilian vehicles and missile trajectories can be misinterpreted as threats to national security. However, Vitale says that the risks involved with possessing, testing and using ICBMs more than outweigh the benefits the United States government believes it gains. Because of the severity of the issue, Vitale believes in the significance of actively seeking the end of the use of ICBMs. “If you know of some heinous crime being done you must do something to stop it,” said Vitale, in a somber tone. Jim Haber, the coordinator of the Nevada Desert Experience, discussed the vital role the United States government plays in the realm of nuclear power. Haber stated that the U.S. needs to set an example for the world in its handling of its ICBMs. As a leader in the fight against nuclear testing in Nevada, Haber supports and engages in the efforts of present anti-nuclear activists. “Our peace actions and civil resistance tonight will wake up the public and political leaders,” Haber said. All four speakers at the conference participated in the protest that occurred at the missile launch site in Vandenberg at midnight Saturday, Feb. 25. Ellsberg was arrested along with 13 other activists but he had already experienced arrest for the same kind of protest in 1983. In a phone interview, the coordinator of Saturday morning’s protest, MacGregor Eddy said she strives to educate the public about the U.S testing and usage of missiles. “I’m trying to make the invisible visible, there’s nothing conspiratorial about it,” said Eddy about the information on the nuclear capabilities of the U.S. Currently, the NAPF is the sole organization grappling with the issues of nuclear power but the rising number of protesters heartens the members of the NAPF. Reaching the complete elimination of nuclear weapons globally is an ongoing process, but participants in the test launch protests refuse to dismiss the issue.